Working class district of London in 1950s. Henrietta Burkin’s memoir covers events prior to her birth and the first seven decades of her life, from 1904-1977. Her autobiographical account is written with intricate detail about nostalgic memories of her childhood, the war and the celebrations she enjoyed with family. Henrietta writes her autobiography at age 77 due to being bed bound by thrombosis. She states, ‘I didn’t know how I was to occupy myself’ (5.5) until her daughter, Elaine suggested writing a memoir. During her illness, Henrietta felt like ‘Queen Mary sitting up in bed receiving her couriers’ (5.5) and this spare time allowed her to commemorate her earlier life and look back with nostalgia. This memoir follows a traditional narrative style. Henrietta creates a chronological account, starting her memoir from her mother’s upbringing and the start of her own life to the present time when she is writing with thrombosis. Her writing is authentic and offers a first-hand account of working class experiences, which I believe provides more truth than other fiction publications. Regenia Gagnier states that memoirs are written with a purpose as we can learn from another’s life as they, ‘record lost experiences for future generations’ (Gagnier, 342, 1987). Henrietta preserves history and displays her remarkable journey from poverty in early life to creating a more prosperous life during adulthood. Henrietta’s autobiography is accessible to all readers as she writes freely and without restriction, which suggests to me that she is writing for an audience to illustrate an accurate account of a working class life during the 20th century. Anthea Trodd acknowledges that many pieces of literature in the early decades of the century focused on working class experiences and the suffrage movement encouraged women to narrate their lives and record their memories (Todd, 8, 1998); the period Henrietta also writes about. Indicated from the opening sentence of her memoir, ‘this was to have been an account of my early youth… but I think I had better commence with my Mother’s early life as told to me’ (1.1), displays intention to be read by later generations in her family or the public. Her intention to write for an audience is further confirmed as she publishes two poems in her memoir titled, ‘The London of my Youth’ and ‘Elaine’. Her first poem is dedicated to her sentimental memories of living in London as a child and states that her memories ‘as tho’ twere but yesterday, and not sixty years ago’ (1.25). Contrastingly, her second poem looks to an aspiring future for Elaine and anticipates ‘the wide door to ambition’ (3.20). These poems provide a deeper insight to Henrietta’s emotions and the rhyme scheme offers permanence and a lyrical tone for its readers. The memoir’s title, ‘Memoirs of:- Henrietta Burkin’ is modest and does not glamorize her account. In fact, she portrays an unpretentious persona as she simply seeks to educate and represent others alike to her. Henrietta presents herself as an introverted individual and does not express any strong or controversial comments. When she describes situations, she presents all sides of the argument and does not seek to take sides, displaying her conciliatory and mellow personality. This trait is displayed particularly when discussing the rivalry between Protestants and Catholics. It is clear from her memoir that she is a Protestant. She does however, uphold her dignity without hostility even when others around her are judgemental (1.17). Throughout the memoir, Henrietta remains proud of her past and present and lives with no regrets. She displays deep love and care for her family and at the end of her memoir, she displays her eagerness and excitement to celebrate her Golden Wedding Anniversary with Harry (5.7). Although other working class writers display the hardships of a poverty stricken life, Henrietta writes optimistically to celebrate her life with her readers. 2:118. Burkin, Henrietta, ‘Memoirs of Henrietta Burkin’, TS, pp.86 (c.50,000 words). Brunel University Library. Extract published in J. Burnett (ed. ), Destiny Obscure: Autobiographies of childhood, education and family from the 1820s to the 1920s (Allen Lane, London, 1982), pp.306-312. Brunel University Library and Ruskin College Library, Oxford. Trodd, Anthea. Women’s Writing in English: Britain 1900-1945. Longman: London. 1998. 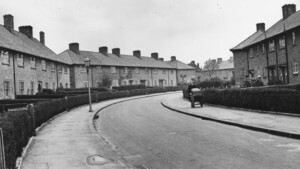 ‘The Beacontree Estate in 1950’ in Why have the White British left London? by Martin Easton. BBC Website. 20th February 2013. http://www.bbc.co.uk/news/uk-21511904. 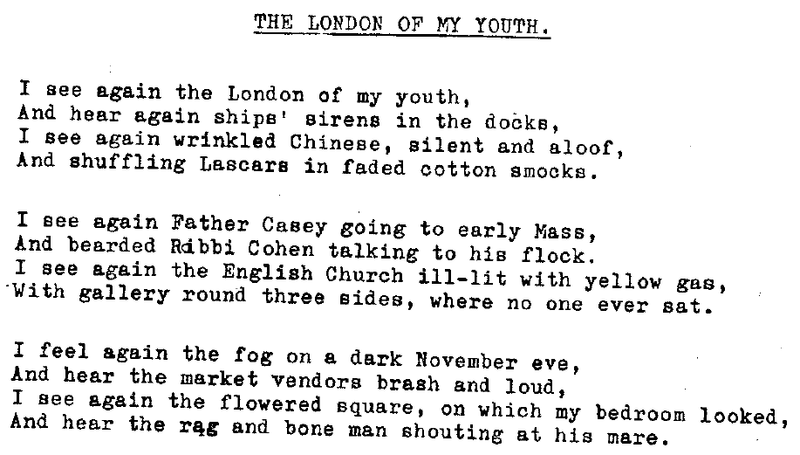 “The London of my Youth” poem by Henrietta Burkin – taken by myself (26/10/2015).